Designers' hands are tied to some degree when it comes to vehicle styling. Long, flat hoods and a vertical grill are required to meet pedestrian safety standards and both of these requirements influenced the new Accord's look. That doesn't mean the Honda design team didn't do a fine job. They did. One plus is that Honda has avoided any controversy. There is no design element upfront that will polarize shoppers (like the Acura shield grill). In fact, the car is almost devoid of any grill enhancements. The real change is to the rear quarter and back of the Accord. Rather than a three-box design, Honda opted to use a fastback design. There are two main advantages to this, other than style. First, it slightly increases passenger volume. The area under the sloped rear window gets counted. So on paper, the Accord will have an edge over cars with a more traditional sedan shape. Second, the shape is more aerodynamic. Stylistically, the Accord now moves toward cars like the gorgeous Audi A7. This is the trend and most buyers prefer it. Some may like the older sedan style, but Honda needed to modernize the Accord and it deserves credit for freshening up the look of this new generation. The low-selling coupe body style is retired for 2018. We will miss the coupe. It was Honda's best-looking vehicle, aside from the Acura NSX. If there is a vehicle this size with better ergonomics, we haven't tested it. In the new Accord, everything works. Yes, there is a volume and tuner/selection knob, as there should be in everything on wheels. Not everything old is bad, and humans have evolved to expect these knobs, so Honda wisely included them after having removed them on some other recent models. The HVAC system is dead simple to operate, and with almost no practice you will be doing it without looking. No need to hunt and peck through infotainment menus to adjust temperature or to turn on a heated seat. Honda didn't forget the real-world aspects of a family vehicle either. Cup holders are perfectly situated. USB ports are in places to work with things that actually require a USB port. The place where your phone goes is the shape of an actual phone, and it will charge your phone wirelessly in some trims. Seats in the 2.0T Touring Accord we tested were outstanding. The adjustments are where they should be, alongside the seat and finding a comfortable position was quick and simple. The lumbar is adjustable in two ways, rather than just in and out, and that can help many drivers who fall outside the average for height. Those who live in hot areas will appreciate that the perforated leather seats are not just heated, but also cooled. In back, the seating area is huge. The Accord is now a large car by the EPA's guidelines and it shows most in back. Headroom is also good in the back, despite the low appearance of the roofline. 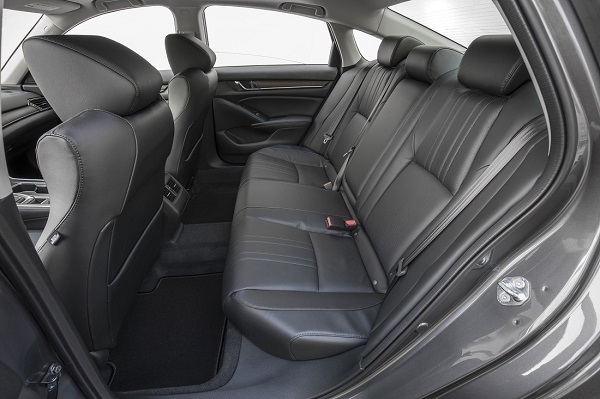 Rear passengers get almost two and a half more inches of legroom in the Accord than in the Camry, and overall the Accord has more interior room. The quality of the Accord's interior is what we would term just right. Honda didn't cover every inside surface with leather and microfiber suede, but the trim is attractive and well executed. The materials feel richer than the $36,000 top-trim price would seem to demand. The one drawback of the new Accord's interior is driver knee room. 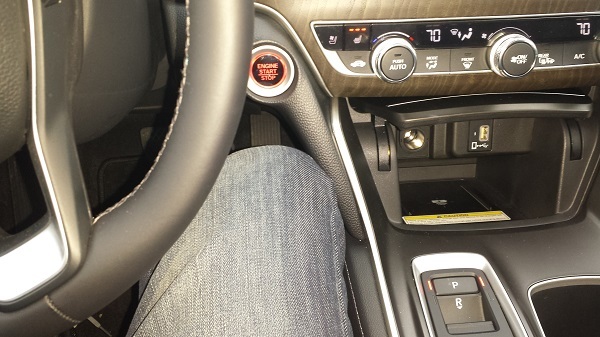 Tall drivers will find that their right knee is in contact with the center console. Rather than padding that area, Honda left it hard plastic. By contrast, we drove a Honda Fit, the smallest car Honda makes in America, and it had more room in that regard. Honda opted to make the Accord's center tunnel large and it is a costly design choice. Technology in cars can go too far, or there can be key things missing that make a car seem old before its time. Honda's new Accord has neither of these problems. Our 2.0T Touring's infotainment package was perfect in all regards. Ergonomically, Honda made some cool advances. For example, the most commonly tapped-buttons are actually buttons and they are located along both sides of the touchscreen. This makes selection easier and also reduces fingerprints. We've already mentioned the volume and tuner knobs, but we are so happy they are back, we figured we'd say it again! 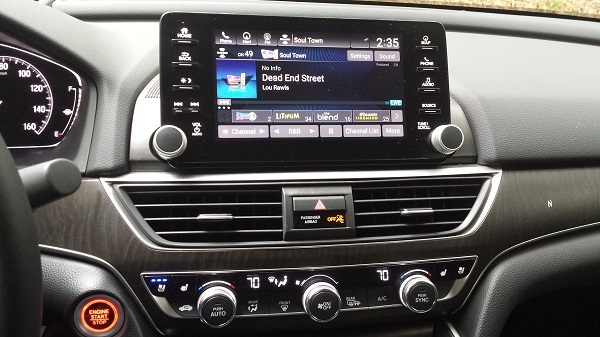 The infotainment menus are simple and easy to navigate and Honda allows for many of the vehicle's settings to be selected by the owner, something often reserved for premium brands. Audio quality from the 10-speaker premium system in our Touring trim was very good. Not the same level as the optional $3,500 systems in some premium cars we have tested, but certainly better than average in the affordable midsize segment. The navigation system built into the car was also good, but not perfect. The real-time traffic reports didn't seem as good as Google Maps' version. So we simply plugged in our Android phone and switched the view to Google Maps. Yes, unlike the Camry, the Accord has Apple Car Play and Android Auto. If you were looking for a tie-breaker between these two great cars, this may be it. Honda has future-proofed this Accord. The Camry is already behind the times. The Touring trim we drove had a color head-up display that was adjustable for viewing location. This is just one of the many technological advances now trickling down to the mainstream that Honda has adopted. The Accord most people will own has a four-cylinder, 1.5-liter turbocharged engine and CVT transmission. It is rated at 33 mpg combined and 30/38 city/highway. This is excellent fuel economy for a large car, but the Camry edges the Accord in every fuel economy category. We tested the 2.0-liter turbocharged Accord with the automatic 10-speed transmission. In over 200 miles of highway driving, we saw 33.5 mpg. As far as we can tell, Honda is planning to rate all Accords with regular unleaded, but the official EPA info on the 2.0T is not yet available. Consumer Reports predicts that the 2018 Accord will have a 4 out of 5 score for predicted reliability. Yet, in every past year back to 2011, the Accord earned the highest actual scores based on consumer surveys. Perhaps Consumer Reports remembers 2003, the year Honda changed its transmissions and saw many failures? In JD Power's latest Initial Quality Survey, Honda had dropped to well below average in quality based on owner reports after 90 days of ownership. The 2018 Honda Accord earned a Top Safety Pick+ from the Insurance Institute for Highway Safety. It earned top scores across the board, including on the new passenger-side small frontal overlap crash test. Every new Accord comes with standard active safety including automatic emergency braking (something all new cars are trending towards). The Accord is as safe a car as exists in the US market. One feature that Honda offers that most brands do not, is low-speed follow. This system works with the adaptive cruise control to allow the Accord to follow behind a car in traffic with no inputs from the driver. Both speed and lane keeping are managed by the car. Honda also offers drowsiness sensing and alerts. Performance is always relative to a given car's segment and price point. That said, we feel the new 2018 Accord 2.0T Touring transcends its segment. With 252 hp and 273 ft-lb of torque from a very low 1,500 RPMs, the Accord 2.0T is quick in all scenarios. Enable the Sport mode and the car is downright fast. The new Accord felt more than the equal of the outgoing Accord's V6-equipped trims. Handling is sharp and the Accord is fun to drive aggressively. Back-road blasts are satisfying and highway cruising is superb. 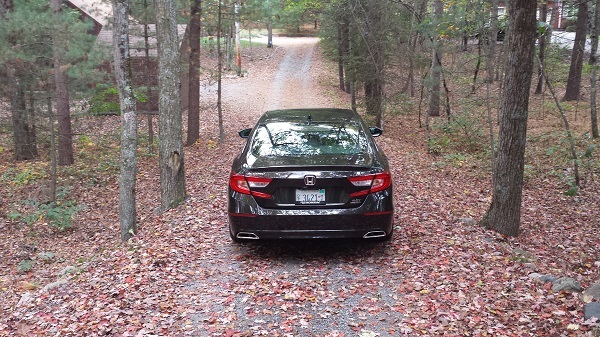 Around town, the Accord is not overly harsh, even when equipped with its optional 19-inch, low profile tires. The Accord 2.0T Touring is the performance match of most premium models twice its price. Want even more involvement than the 10-speed auto with paddle shifters can offer? Opt for the six-speed manual transmission. Yes, Honda is offering the Accord with a six-speed with both of its turbocharged engines. We should note at this point, that there is also an Accord Hybrid due in calendar year 2018, which should get a full review in the future since it is so different. No car segment offers more bang for the buck than the midsize family sedan market. Among the best values has always been the Accord. Our 2.0T Touring is the very top of the pecking order and came in at an MSRP, including delivery of just $36,675. At this low price point, Accord makes many entry-level premium cars look downright silly. The base Accord starts at about $24,000 and there are many trims to choose from in both engine styles. That allows buyers to easily opt into the options and features that matter to them. "Almost everything" is the simple answer to what we love about the new 2018 Honda Accord. Particularly the changes under the skin. The Accord ups the ante in terms of technology and safety. It also has finally broken with its tradition of high-revving, normally aspirated (non-turbo) engines to provide a new, higher level of performance and fuel efficiency that owners will appreciate in real work driving. 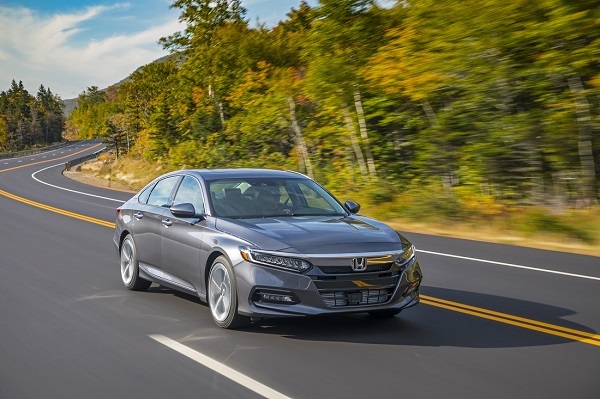 Having tested the top trim, we feel that Honda made wise choices about how far to go with the Accord in terms of luxury and performance while keeping an eye on affordability. The new Camry is also impressive. It too has new engines and new styling for 2018. Accord tops the Camry in two key ways. First, more room. Second, by including Apple Car Play and Android Auto. (How Toyota can continue to opt out of this key technology is a mystery to us.) Subjectively, we see the Camry styling as more attractive than the new Accord's. Toyota also offers two years of included maintenance and has higher quality and reliability ratings. There are many other good cars in this segment. We would cross shop the Accord with the Hyundai Sonata and Kia Optima, two models that seem to be keeping pace with the best. The new Accord will make its loyal customers very happy. It may also capture new buyers with its more modern technology. The Accord belongs to a market that expects greatness and Honda has delivered in every possible way. Interested to see how the 2018 Honda Accord ranks against similar cars in terms of key attributes? Here are the 2018 Honda Accord rankings for MPG, horsepower, torque, leg room, head room, shoulder room, hip room and so forth.